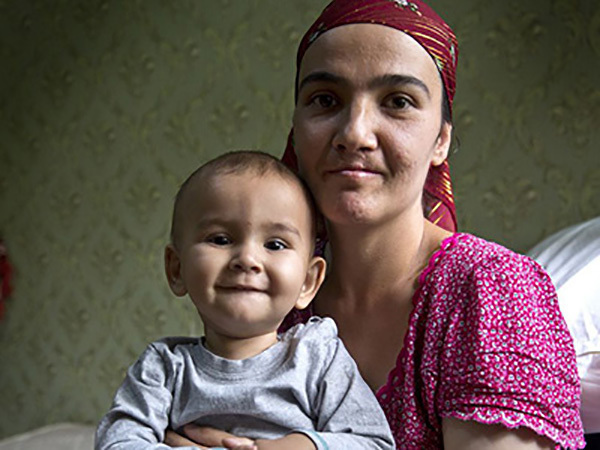 Fatima approached one of the Baby Homes in Dushanbe, Tajikistan to place her son into their care. Working within their policy to attempt to keep families together, staff and NGO partners at the home offered another solution. They were able to house Fatima and her son in a shelter shared with another woman and her children. Fatima’s story is not uncommon. She was the fourth wife of a man who was physically abusive. She also had difficulties with her husband’s other wives, his sisters and his mother, who lived in the same home. They shared a crowded house and Fatima says that she was always unwelcome. Her son also suffered abuse from the family. She felt she had no choice but to leave. With no money, no family support and nowhere to live, she needed to find some income. However she could not afford childcare for her young son, nor could she afford to feed him. Her only choice was to turn to a Baby Home, or orphanage. ‘I have only one child— of course, I don’t want to give him away. It was a very hard decision to make. I felt I didn't want to be separated from my child. All the time I was trying to find a solution to my issue but I couldn't. There was a moment when I was thinking about suicide’. Thanks to newly developed respite services offered through the Baby Home in Dushanbe— facilitated by HealthProm and delivered through local partners— Fatima is looking at a brighter future. She is now fully supported to start to build a life for herself and her son. HealthProm’s partner organisation provides food and basic necessities as well as shelter. They have set Fatima up with training in tailoring so that she can be able to support her family in the future. By keeping this family together, both mother and son are able to contemplate a better life.